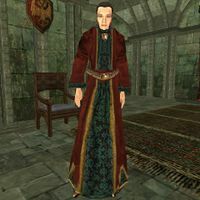 Asciene Rane is a Breton mage who provides transport to Mournhold once you have been attacked by the Dark Brotherhood and have spoken to Apelles Matius. She wears an expensive robe and matching shoes. "Greetings, friend, what may I do for you?" "Hello, friend. Are you seeking transport to Mournhold again?" Asciene Rane: "I am Asciene Rane. How may I help you, friend?" Background: "I am Asciene Rane, Mage." Dark Brotherhood: "Horrible people. Stay clear of them, my friend." "You wish to go to the mainland? That's highly irregular. I'm sure you've heard that they've restricted travel to Mournhold. They've been a bit worried about the Blight. What's your reason for wanting to go to the city?" "Heading back, are you? Hope you've gotten all that business cleared up." Yes, please. "I'll transport you right away. Good luck to you!" No, not now. "Well, you let me know when you wish to return. You've certainly got reason enough to go!" She will still offer you transport to Mournhold if you're a vampire, and/or if there's a death warrant on your head. This page was last modified on 30 April 2017, at 13:09.